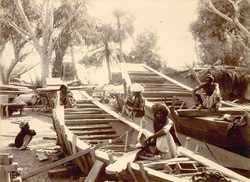 Photograph of men at work constructing wooden boats at Sukkur in the Sindh province now in Pakistan taken by an unknown photographer in the 1890s. Sukkur is an ancient town on the west bank of the Indus, with the town of Rohri on the opposing bank. It is best known today for the Sukkur Barrage nearby, built 1923-32, which controls one of the largest irrigation systems in the world, and as a base from which to visit the archaeological site of Mohenjo Daro, which flourished 5000 years ago as a centre of the Indus Valley Civilisation. Modern Sukkur, which was developed in the 1840s by Sir Charles Napier after the conquest of Sindh, is an important commercial and industrial city and a centre for trade with Afghanistan. Boat building was an extremely important industry here in the 19th century employing men from all over Pakistan. The Indus flows from Tibet in the Himalayas to the Arabian Sea, and nomadic boat peoples of the Lower Indus Basin in Sindh used to travel freely up and down the river in their wooden craft, until the barrages contructed across it impeded their movements from the 20th century onward. Called the Mohanas, some of the boat people still live on their boats near Sukkur, although many are forced to live in settlements on the river banks. Traditional wooden boats are also used as fishing vessels, and while both men and women went out in the boats in the past, women are less visible now due to the paucity of fish caused by over-management of the river and over-fishing. This photograph is from an album of 91 prints apparently compiled by P. J. Corbett, a PWD engineer involved in irrigation work at the famine relief camp at Shetpal Tank in 1897, and in canal construction in Sindh in the early 1900s.